From their very first day to their retirement party, you have a thousand chances to build a meaningful employee relationship. An employee’s first day is your first day, too. It’s the first day to engage, impress and establish a relationship that can impact your business for years. We can help you express the kind of appreciation that makes a positive impression from day one and beyond. An anniversary is always a cause for celebration. But it’s more than honoring an employee’s dedication and commitment; it’s also about recognizing how his or her efforts have benefited the company and everyone in it. We make celebrating the individual and the accomplishment a more memorable and meaningful event. The culmination of a successful career is an important occasion for recognition and an opportunity for inspiration. It is a time to honor an individual’s contribution and dedication while establishing a legacy that others can use to guide their own career paths. We can help you celebrate the individual and all they have done for the company. Because today’s employees tend to switch jobs, recognizing them early and often increases engagement, making for more satisfied and productive workers. More memorable. More meaningful. That’s Hallmark. In all stages of an employee’s career, your recognition and appreciation are vital to their confidence in the company, pride in their role and overall performance. Create excitement, convey emotion and express gratitude and respect with a little bit of help from Hallmark—the worldwide experts in relationship-building. It’s recognized immediately…the envelope, the crown logo, the quality…all of which combine to convey an unmatched level of caring. 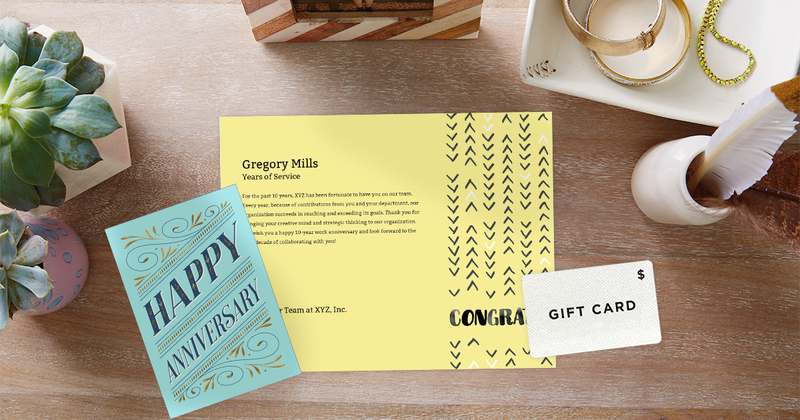 Now personalize with your message and even customize it with your company logo, and you have a unique expression that engages, inspires and celebrates your employee’s milestone. Easily communicate the prestige of an accomplishment in a professional form that your employees can proudly display. Choose from a variety of designs and personalize to commemorate achieving a specific goal, upholding company values or simply as an expression of gratitude. Our award certificates help foster employee engagement and strengthen organizational beliefs, confidence and pride. Mark milestones with rewards that have a built in benefit by giving your employees the ability to choose from hundreds of retailers, restaurants, travel and entertainment providers. With power-of-choice gift cards, your honorees get to reward themselves with a gift they truly desire, appreciate and can take pride in sharing with family and friends. The benefits of effectively engaging and recognizing your employees are easy to see—greater satisfaction, motivation and productivity. 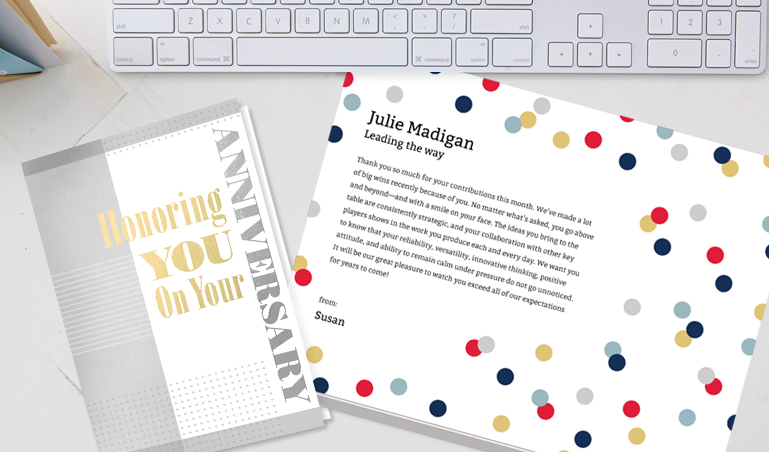 From a moment’s notice to months ahead of time, we make it easy to schedule, order, personalize and fulfill your employee recognition greeting cards, certificates and gift cards. We eliminate the worry of missing an important career event with seamless data integration. Plus our quick fulfillment means you can reward in record time, so the excitement of the moment isn’t diminished or forgotten. Most importantly, we give you effective solutions that come from the heart and impactful rewards that people love. With Hallmark Business Connections, it’s easy to recognize outstanding employees.